Janet and Jen strive to bring you topics that matter and trends that you need to know about, along with the inspiration and support you need to parent and teach “tomorrow’s men” to be their best and thrive right now. After almost a year of recording our weekly podcast, Janet and Jen want to turn the microphone over to YOU!! We want to connect LIVE with you, our listeners. 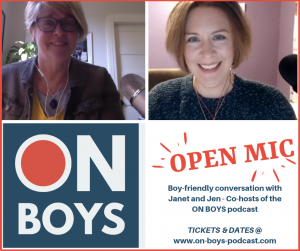 Janet and Jen are “BOY CHAMPIONS” and love to share their experiences – in teaching boys, raising boys, and being boy advocates for over 35 combined years! During this OPEN MIC, we’re ready to discuss and answer ANYTHING-BOY you want to talk about…. Each OPEN MIC event is 60 minutes. Invite a friend – and we’ll see you soon!